I’m sharing the perfect Fall look in today’s post. I love that moto jackets are edgy and classic all at the same time. I finally took the plunge and made the decision to purchase and invest in this green moto jacket and I’m so glad I did. The fit compliments any body type, and the color is to die for. I’m wearing a size small for reference. 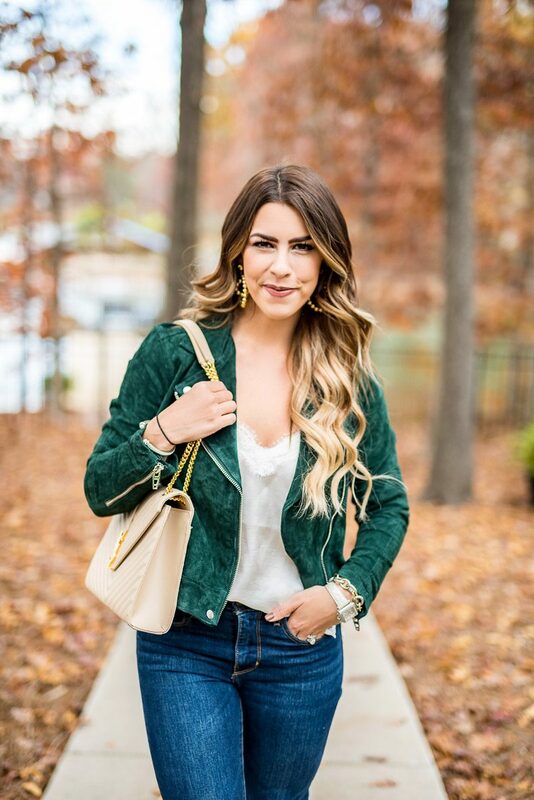 If you’re not crazy about wearing the color green (fun fact – Drew isn’t), then this jacket comes in a lot of different colors that are perfect for Fall. I received a lot of questions on ways to style this jacket since it is an investment piece. Sure, styling it over a camisole is one of the more simple ways, but you can create a variety of looks using this moto jacket. I personally love it paired with a feminine skirt. The combination of masculine meets feminine is super chic. I also love this moto jacket paired with a pair of casual joggers and a t-shirt. It helps dress down the suede material. All and all it’s a great investment piece that can be styled many ways for a variety of looks, and you will not be disappointed in the investment. Every girl should have one of these in their closet for Fall! You have a million dollar smile and I’m loving your suede jacket! Hi, I actually just bought this same jacket this weekend! I bought the more carmel/camel color (not the midnight toker color online, there were way more color options in the store). I was thinking for a winter look of doing an all black look (black denim/black sweater) so it can be stylish yet have the focus still on the jacket. For more of a spring/fall look i was thinking of doing light denim with a white top underneath to keep the vibe lighter. I love the idea of a feminine skirt/dress to keep the look classic (as you mentiontioned above). Hope this helps!